Flannel Friday! Air, Ground or Water? I am super excited today because this is my very first Flannel Friday! In a few weeks, I’ll be doing a storytime theme of Going on a Journey, so I created this flannel idea to go along with that. The basic gist of it is to determine if a form of transportation travels by air, ground or water. To save time (and my sanity), I made this set out of laminated clip art with velcro on the back. 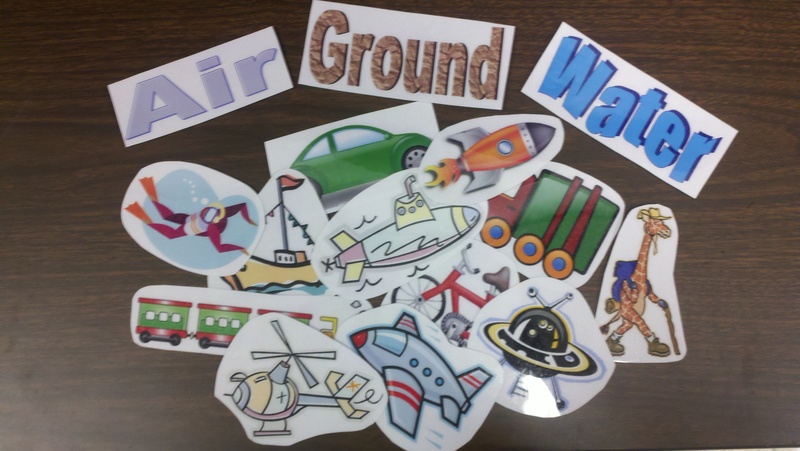 If my group of kids skews to the older side, I’ll probably hand out the various clip art and have them come up and put their method of transportation under the correct heading. And if my group of kids skews to the younger side or is more of a mix, I will either have us place them under the headings together, or I’ll put them under the headings myself and be sure to put a few in the wrong group and have the kids tell me how to correct it. Edit: Oops! I forgot to link to the rest of the Flannel Friday round up, which is at Mel’s Desk this week. Please consider it a beginner’s mistake! Guessing games are great for story times. Welcome to Flannel Friday! Thank you for the warm welcome! I love using guessing games in storytime, because the kids love it and it really gets their attention. Welcome to Flannel Friday! Sounds like a super fun sorting flannel — great for a ton of different storytime themes! Thank you! I’m so happy to be apart of Flannel Friday! I’ve been admiring everyone’s flannels for months now, and I wanted to join in on the fun! Nice one! Could have done with this one last week for vehicles storytime – I’ll save it for next year – thanks! That happens to me all the time: I do a storytime, then a week or two later, someone posts a flannel that would have been perfect for it. There’s always a moment of “Why didn’t they post this one sooner?” but then I realize that it just means I’ll be able to add something new and fresh to the theme when I do it again at a later date.